Elisabeth was born in Pittsburgh, Pennsylvania, but most of her 'growing up' took place in Orlando, Florida, where she wallowed in all things Disney. Traveling much with her family led to an obsession with history and an interest in other cultures throughout the ages. She has always loved children's literature and film, especially fantasy and historical fiction. Elisabeth earned a dual degree BA from the University of Florida in English and visual art studies. She earned her master's degree in illustration at the School of Visual Arts in New York City. She now lives and works in Western Massachusetts, along with her husband, illustrator Scott Murphy. 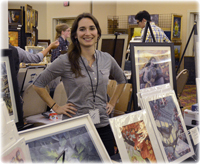 She is a member of SCBWI and the Western Massachusetts Illustrators' Guild. Her work has been recognized in 3x3 Vol.6, Illustration West 51, Infected by Art 3 and 4, Spectrum 23, and Imagine FX magazine.